is there a way u can add shimmer to ur eyeshadow ? my eyeshadow r flat and i dont wanna buy new ones is there anything i can mix it with to add some shimmer? buy just the shimmer powder i have a container of it from i think covergirl i will mix it in my eye shadow case and blend on my eyes. i think it is great bc you can change any eyeshadow! 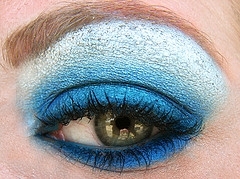 This entry was posted in Glitter Makeup and Nails and tagged cosmetics, eyeshadow, makeup, wishlist on January 2, 2009 by admin.